According to the Oxford dictionary, the definition of holiday is: a day of festivity or recreation when no work is done. Well, we all know too well, there’s plenty of work involved in preparing for the holidays. 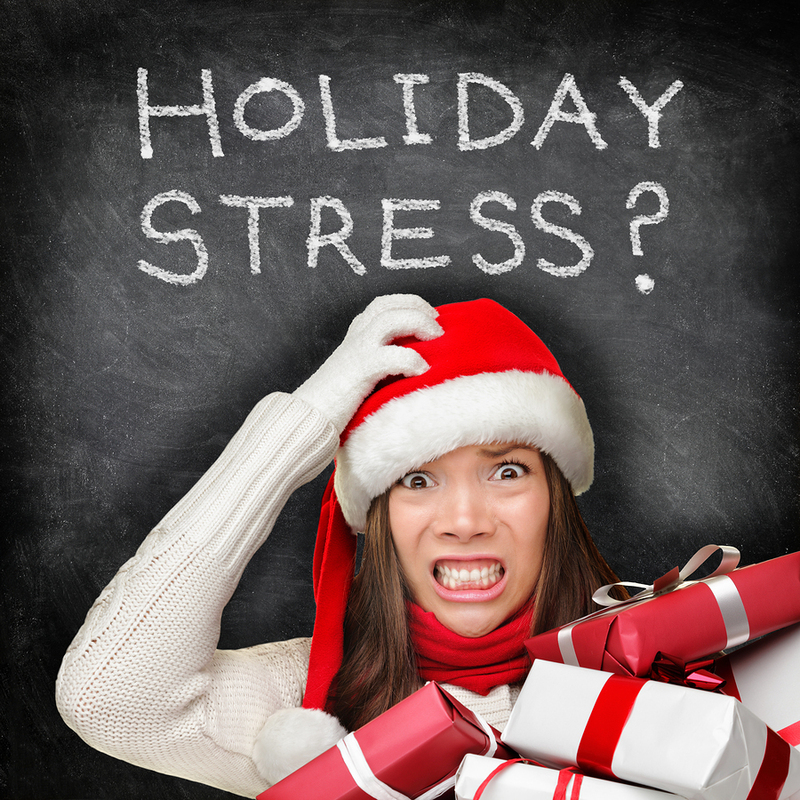 Take the stress of shopping, deadlines, putting in extra hours at work, over-indulging, over extending the credit card, and the mother-in-law visiting. Add all that to the rest of the stress that’s been accumulating over time, and you’ve got the perfect recipe for burnout. Stress is an unavoidable part of our daily lives. A certain amount of stress is actually necessary for our survival; however, the amount of stress most people are under these days is causing more harm than good and can have serious health implications. 75%-90% of all medical visits are in some way related to stress. Stress, no matter where it is coming from, disrupts your body’s internal balance, known as homeostasis. There are two different categories of stress: acute (short term) and chronic (long term). Acute stress occurs when, for example, you have to slam on the breaks in the car, someone scares you or you are running late. Chronic stress is long lasting and is linked to serious side effects. Examples of chronic stress are taking care of a sick parent, feeling unhappy in your home life, enduring a long illness or a drawn out divorce. When you feel stressed, your brain is affected. Your autonomic nervous system cannot tell the difference between physical and emotional stress, therefore, it reacts the same by secreting adrenaline & cortisol. Adrenaline keeps you alert by increasing your heart rate, blood pressure and quickly mobilizes energy reserves and cortisol works more slowly, helps to replenish energy supplies and readies immune system to handle any threat. Eat nutrient rich diet. Eat only the highest quality foods and stay away from junk and processed foods. Delegate some of the holiday chores, household and childcare responsibilities to other family members. Avoiding sugar and white flour products. Ironically, these are the foods that many stressed out people love to eat. Eating them in excess leads to hypoglycaemic symptoms (blood sugar highs and lows), which only aggravates your stress even more. Getting adequate rest. Sleep in a room that is as dark and quiet as possible. Avoiding pollution, chemical, and pesticide exposure as much as possible. Replacing unpleasant, worrying and limiting thoughts with loving and liberating thoughts. Surrounding yourself with positive, loving people. Spend fifteen minutes a day doing something that brings you joy. Speak with your friendly nutritionist (aka me 🙂 ) who can guide you and make recommendations for dietary changes and nutritional supplements specific to your needs. 1.Pour the water into a large saucepan and turn on the heat to high. Add the ginger, cinnamon sticks, anise seed, peppercorn, cardamom pods, cloves and coriander. Bring this mixture to a boil and then simmer over medium heat for 20-30 minutes. 2.Remove from heat and add the honey, molasses, vanilla and lemon juice. Give a little stir andadd the tea bags. Let steep for about 10 minutes. 3.Pour the chai tea through a fine sieve or mesh into a large glass container with a pouring spout.Once the mixture has been strained, pour into 16 oz glass jars. You can keep the concentrate forabout a week in the fridge or in the freezer for a few months. 4.When you are ready for a cup of this tasty goodness, add the concentrate to milk of your choicein a ratio of 1:1 and enjoy! If you are using almond, coconut or rice milk, make sure you areusing the unsweetened version. Depending on your taste buds, you can play with the ratios toget a taste that you like best. Enjoy! Have you ever worried about your liver? Most people would answer “no” unless they’re heavy drinkers but with the holiday season approaching that often means that alcohol intakes increase and that can take a toll on the liver. Garlic – high in sulphur, which helps to detoxify the liver. Cruciferous vegetables – such as kale, Brussels sprouts, broccoli, cauliflower, and cabbage are high in Indole 3 Carbinol. Two servings a day helps to balance hormones and reduce PMS and menopausal symptoms by blocking man-made chemicals from converting into estrogen mimickers. Artichokes – the active ingredient in this cleansing food is caffeoylquinic acid – a carcinogenic inhibitor, which protects and regenerates the liver. Turmeric – when taken in a high concentration, has powerful anti-inflammatory properties. Commonly used in Ayurvedic medicine to treat liver and gallbladder disorders. Dandelion root tea – the liver loves anything bitter. Dandelion root stimulates the production of bile which helps to improve conditions such as liver congestion, bile duct inflammation, hepatitis, gallstones, and jaundice. Water with lemon – drinking freshly squeezed lemon juice in a cup of boiled water first thing in the morning helps to cleanse the liver and promote detoxification. It also stimulates bile production, cleanses the stomach and stimulates bowel function. Beets – for thinning and moving the bile. Aids weight loss and relieves digestive discomfort by improving assimilation of fats and improving gallbladder function. Apples – contain pectin which binds to heavy metals in the body (in particular in the colon) and helps with their excretion. This reduces the load on the liver and its detoxification capacities. Bitter salad greens – (dandelion, chicory, arugula, endive) – The bitterness of these foods helps to stimulate bile flow within the liver. High-fiber foods – such as fresh fruits and vegetables, and whole grains are especially helpful in keeping the liver healthy. Choose one or two foods from this list to eat every day to ensure a well-functioning liver. Over the years, our lives have become more hectic and fast-paced than ever before. We are working to earn a living, taking care of our homes, raising children, trying to socialize and still have time for ourselves. We are constantly being bombarded with external stimuli, from television and computers, to phones and PDAs. Many of us are so accustomed to giving and receiving information instantly that we forget to slow down and reflect on ourselves. Our diets are full of sugar, caffeine and processed foods, and more and more, our emotional health and physical activity seem to take a back seat. We are left feeling exhausted before bed, while not waking feeling refreshed. Unhealthy sleep habits can have a harmful impact on carbohydrate metabolism and hormonal balance. Here are my top 5 dietary and lifestyle tips to help you improve your sleep pattern. Establish regular sleep hours. Try to go to bed and wake up in the morning around the same time every day, even on the weekends. Go to bed before 11:00 pm, preferably by 10:00 pm. Our stress glands, the adrenals, recharge between the hours of 11:00 pm-1:00 am. Avoid raising your blood sugar levels at night. Try not to eat in the two hour period before going to bed. If you’re feeling hungry, choose a snack that contains protein because it is a source of the amino acid, tryptophan. We convert tryptophan into serotonin and melatonin, which are the hormones important for sleep. The sugars from fruit may also help tryptophan reach the brain more easily. Avoid caffeine, nicotine and alcohol. These are all stimulating and result in increased heart rate, rapid breathing, increased brain activity and higher levels of stress hormones. If you are wanting a snack in the evening (2 hours before bedtime preferably) then you want to be choosing a low glycemic snack like apples with almond butter, raw veggie sticks and a couple of tablespoons of hummus or avocado or some plain Greek yogurt sweetened with cinnamon, vanilla extract and cacoa powder.